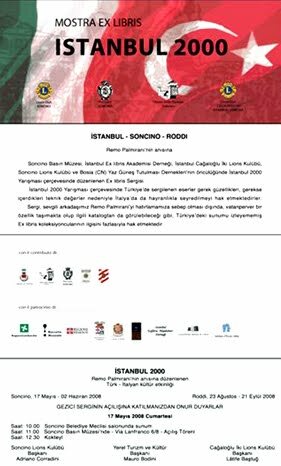 Istanbul Exlibris Academy Society is established in 13 August, 1998 whose abbreviation is IEAD. The art of exlibris was first introduced in Turkey by Latife Bastug, Nurhayat Berker and Mine Arasan. The IEAD who aims at reaching quality art products based on universal values, therefore sponsors artists from different educational and cultural backgrounds without any discrimination in their effort to produce unique art products. exhibitions and contests for those who would like to learn and apply exlibris as well as review it. 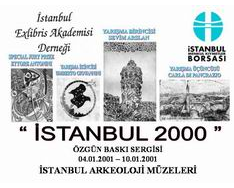 İstanbul Exlibris Akademisi Derneği,13 Ağustos 1998’de İstanbul’da kuruldu. Kısa adı İEAD’dir. Türkiye’de Exlibris Sanatı ilk olarak Latife Baştuğ, Nurhayat Berker, Mine Arasan ile tanıtılmıştır. Evrensel değerlerle üretilmiş, nitelikli sanat yapıtlarına ulaşmayı hedefleyen, anlayış ve eğitim farkı gözetmeksizin, sanatçıları, özgün sanat yapıtları üretimi konusunda desteklemeyi ilke edinmiştir. • İlgili Bakanlıktan izin almak koşuluyla ülkemizin ulslarararası etkinliklerde yer almasını sağlamak, yurtdışındaki benzer amaçlı dernek ve kuruluşlara üye olmak, ortak çalışmalar yapmak. A bookplate, also known as ex libris [, "from books"], typically bears a , , , , , , or any design that signifies ownership of the book. It is usually followed by a name in the , e.g., "from the books of . . . " or "from the library of . . . " It may also be written as ex libris. Exlibris which practically refers to graphic art is developed with the invention of print. While manuscripts were in the custody of royalty and the church, they were made available for lower class nobles and the educated bourgeoisie with the advent of print. Due to wide number of copies print has produces the need for indication of ownership has aroused. It is known to us that exlibris was used in Southern Germany in 15th cc. The earliest surviving example of a printed bookplate belongs to Germans which was produced for Johannes Knabenberg whose nickname was “igler-hedgehod” therefore depicting a hedgehod biting a flower in the countryside (size 19cm). Inscriptions indicating to the ownership of the book were scarcely available in Europe. The oldest movable ex-libris are certain woodcuts representing a shield of arms supported by an angel (See Figure 1), which were pasted in books presented to the monastery of Buxheim by Brother Hildebrand Brandenburg of Biberach, about the year 1480—the date being fixed by that of the recorded gift. The woodcut, in imitation of similar devices in old manuscripts, is hand-painted. In France the most ancient ex-libris as yet discovered is that of one Jean Bertaud de la Tour-Blanche, the date of which is 1529. comes next with the plate of Anna van der Aa, in 1597. A sketch of the history of the book plate, either as a minor work of symbolical and decorative art, or as an accessory to the binding of books, must obviously begin in Germany, not only because the earliest examples known are German, but also because they are found in great numbers long before the fashion spread to other countries, and are often of the highest artistic interest. is known to have actually engraved at least six plates (some of very important size) between 1503 and 1516, and to have supplied designs for many others. Several notable plates are ascribed to Lucas Cranach and to , and to that bevy of so-called Little Masters, the Behams, Virgil Solis, Matthias Zundt, Jost Amman, Saldorfer, Georg Hupschmann and others. The influence of these decorative styles over Germany has been felt through subsequent centuries down to the present day, notwithstanding the invasion of successive Italian and French fashions during the 17th and 18th centuries. The heavy, over-elaborated German style never seems to have affected neighbouring countries; but since it was undoubtedly from Germany that was spread the fashion of ornamental book-plates as marks of possession, the history of German ex libris remains on that account one of high interest to all those who are curious in the matter. It was not before the 17th century that the movable ex libris became common in France. Up to that time the more luxurious habit of stamping the cover with a personal device had been in such general favor with book owners as to render the use of labels superfluous. From the middle of the century, however, the ex libris proper became quite naturalized; examples of that period are very numerous, and, are very handsome. It may be here pointed out that the expression "ex libris," used as a , which is now the recognized term for book plate everywhere on the continent, found its origin in France. The words only occur in the personal tokens of other nationalities long after they had become a recognized inscription on French labels. In many ways the consideration of the English book plate, in its numerous styles, from the late to the late, is peculiarly interesting. In all its varieties it reflects with great fidelity the prevailing taste in decorative art at different epochs. Of English examples, none thus far seems to have been discovered of older date than the gift plate of ; for the celebrated, gorgeous, hand-painted armorial device attached to a that once belonged to Henry VIII, and now is located in the King's library. The next is that of Sir Thomas Tresham, dated 1585. Until the last quarter of the 17th century the number of authentic English plates is very limited. Their composition is always remarkably simple, and displays nothing of the German elaborateness. They are as a rule very plainly armorial, and the decoration is usually limited to a symmetrical arrangement of mantling, with an occasional display of palms or wreaths. Exlibris has become the image of its owner reflecting his cultural background especially for the rich and nobles who had used it as card visit. First exlibris society was established in 1891 by J.Leicester Warren in Belgium. That society did not only pioneer in exlibris ut also set the norms with its studies and helped spread the exlibris with its bulletin conveying addresses of collectors to exchange. Today exlibris is popular because it features the cultural, historical codes of its age and a commodity of exchange among the artists and collectors. Exlibris has been produced with unique art techniques throughout the centuries. The symbol of the technique, the number of copies and which number is the respective copy, signature of the artist and the date of production; if coloured number of colours are indicated at the left corner. We can consider the elaborate stamps of Ottomans indicating to the owner on the manuscripts and printed books as a form of exlibris. Though they do not fall under the category of exlibris in technical terms, they have functioned as exlibris featuring shield of arm of its owner with a unique calligraphy. Turkey came to know exlibris with the loan books from Europe. The European books bearing an exlibris made their way to our country through second hand sales and donated to the libraries by the relatives of the deceased owner. Almost all aged books in National Library, Bosphorus University library, Yap?-Kredi Bank Libraries and Press museum bear book-plates. Book plates are reviewed according to their production techniques, subjects and artists and collected by its fans. Collectors manage to garner so many of them by exchanging the copies from which they have two. Bookplate collectors help improve international relations, develop new friendships and get to know art and technique in different ages. From 1980s onwards exlibris is printed and published in art academies particularly in printmaking and design courses. Our country is known at international exlibris exhibitions and competitions through the works of our artists. 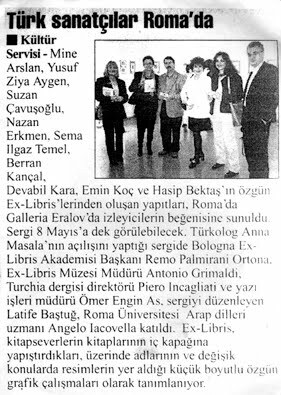 In 3rd Exlibris Biennale in Italy Hasip Pektaş was awarded the first prize, at another competition in Italy another Turkish artist, Sema Ilgaz Temel was awarded the third prize. Kitap plakası (Latince “kitaplardan anlamına gelen”) olarak da bilinen Exlibris; yaygın olarak kitabın iç kapağına yapıştırılan, isim, motto, ailevi sembol, nişan veya kitabın sahibini işaret eden bir kompozisyon taşımasıdır. Genelde “….in kitaplarından biridir” ya da “….ın kütüphanesindendir” şeklinde bir ibare ismi takip eder. Grafik-resim anlamını taşıyan exlibrisler, matbaanın icadıyla birlikte yapılmıştır. Değerli el yazması kitaplar, öncelerisadece kilisenin ve prenslerin ellerinde iken matbaa sayesinde alt düzeydeki soylular ve eğitim görmüş burjuva sınıfı tarafından da elde edilmiştir. Matbaanın çoğaltımı sayesinde, kaybolmalardan ve hırsızlıktan korunması için özel mülkiyet işareti gerekliliği doğmuştur. İlk exlibrisin 15.yy Güney Almanya’da kullanıldığı bilinmektedir. En eski Exlibris örnekleri Almanlara aittir. 1450 yılında “ıgler-kirpi” takma adıyla bilinen Johannes Knabenberg için yapılan ve çayırda bir çiçeği ısıran kirpinin resimlendiği19 cm boyutunda bir exlibristir. Avrupa’da kitabın sahibini gösteren yazıtlara pek ender rastlanırdı. Taşınabilir exlibris, bir meleğin omuz verdiği bir kalkanı gösteren özel ahşap kalıplardı ki bunlar hediyeye kayıt düşülen tarihe bakılırsa 1480 yılında Buxheim’deki Kartusyen manastırına Biberach’lı Hildebrand Brandenburg kardeş tarafından hediye edilmişlerdi. Eski yazmalardaki benzer çalışmalar taklit edilerek yapılan bu ahşap baskı el boyamasıydı. Fransa’da ortaya çıkarılan en eski exlibris,1529 tarihli olup Tour-Blanche’lı Jean Bertaud’a aittir. Anna Van Der Aa’ya ait 1597 tarihli exlibris ise Hollanda da ortaya çıkarılmıştır. İster küçük boyutlu sembolik bir sanat olarak olsun, ister kitapları mühürleyen bir mülkiyet işareti olsun, Exlibris tarihi kesinlikle Almanya ile başlamalıdır. Nedeni sadece en eski örneklerin Almanlara ait olması değil, bu akımın diğer ülkelere yayılmadan çok önce, çok sayıda exlibrisin ve birçok sanatçının bu ülkede bulunmasıdır. Albrecht Dürer’in, bizzat kendisinin 1503 ile 1515 tarihleri arasında en azından altı tane Exlibris yaptığı ve pek çoğuna da kompozisyon hazırladığı biliniyor. Bazı dikkate değerli Exlibrisler Lzucas Cranach ve Hans Holbein ve Küçük Ustalar olarak bilinen Behamlar, Virgil Solis, Matthias Zundt, Jost Amman, Saldorfer, Georg Hupschmann’ın elinden çıkmıştır. Bu dekorasyon tarzları 17. ve 18. yy’daki birbiri ardısıra İtalyan ve Fransız modasının istilasına ve modern düşünceler arasında dikkate değer orjinallikte kompozisyonlara rağmen Almanya’yı ondan sonraki yüzyıllarda ve günümüze kadar etkilemeye devam etti. Ağır ve çok ağdalı Alman stili komşu ülkeleri çok etkilememişe benzese de, süslü kitap plakaları ve sahibini gösteren işretler koyma modasının Almanya’dan çıktığı şüphe götürmez, bu nedenledir ki hepsinin ötesinde Alman Exlibris Tarihi meraklılarını ilgilendirmeye devam eder. 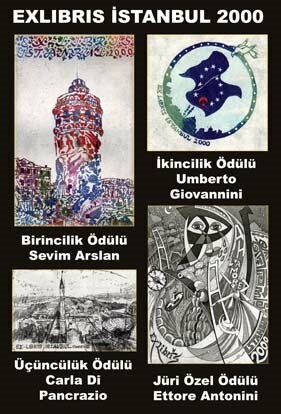 Exlibris‘in Fransa’da yaygınlaşması 17. yy.dan öteye gitmez. O zamana kadar daha lüks bir alışkanlık olan kitabı, sahibini gösteren, şahsi bir şeyle mühürlemek düşüncesi kitap sahiplerinin gözdesiydi. Yüzyılın ortalarından itibaren doğru exlibris sadeleşmeye başladı. Bu döneme ait pek çok örnek vardır ve hepsi de çok güzeldir. Burada bir noktaya işaret edilmelidir ki, bugün kıta Avrupası’nın her yerinde kitap plakasının yerini alan exlibris terimi Fransa’da doğdu. Kelime Fransız başlıklarında kabul gören bir yazıt haline geldikten çok sonra diğer milletlerin de şahsi kitaplarında görülmeye başlandı. Son dönem Elizabeth’ten, son dönem Viktorya’sına kadar pek çok stildeki İngiliz Exlibrislerinin incelenmesi pek çok açıdan son derece ilginçtir. Pek çok çeşidiyle birlikte, farklı devirlerde süsleme sanatına hakim olan zevki, dürüstlükle sergiler. İngiliz örneklerinden hiçbiri bugün Britanya Müzesi’nin Kral Kütüphanesinde bulunan Sir Nicholas Bacon’ın hediye exlibrisi var ki, bir zamanlar VIII.Henri’ye ait olan dosyaya yapıştırılmış o harika, el boyaması, zırhlı armadan daha eskiye gitmez. Ondan sonra gelen en eski exlibris Sir Thomas Tresham’a ait 1585 tarihli olandır. 17.yy.’ın son çeyreğine kadar orjinal İngiliz Exlibrislerinin sayısı sınırlıdır. Kompozisyonları son derece sade ve Almanların süslü tarzından hiç bir iz taşımamaktadır. Prensip olarak sade bir zırh deseni bulunur ve nadiren de olsa palmiye veya çelenkle birlikte kompozisyon, genelde simetrik bir kaftan ile sınırlıdır. 19.yy Exlibrisleri, kitaptan çok sahibinin imgeleri haline gelmiş, kişilerin sosyal, kültürel birikimlerini vurgulayan özellikle, zengin burjuvalar ve asiller tarafından, bir çeşit kartvizit olarak kullanılmışlardır. İlk Exlibris Derneği,1891’de J.Leicester Warren tarafından Belçika’da kurulmuştur. Bu dernek, diğerlerine öncülük etmesinin yanısıra, genel normların belirlenmesi için yaptığı çalışmalar ve koleksiyonerlerin değişim yapabilecekleri, diğer kişilere ulaştıran, adres bültenleri ile exlibris sanatının yaygınlaşmasını sağlamışlardır. Günümüz sanatına baktığımızda, exlibris çok uzun bir geçmişe sahip bu sanat dalı, yapıldığı döneme ait kütürel, tarihsel özelikleri günümüze taşıması nedeniyle de ilgi çekmekte, sanatçılar ve koleksiyoncular arasında önemli bir değiş tokuş objesi olarak kullanılmaktadır. Exlibrisler, yüzyıllardır özgün baskıresim teknikleri ile üretilmekte, exlibris baskıların,sol alt köşesine baskı tekniğinin simgesi,kaç adet basıldığı ve eldeki baskının kaçıncı olduğu,sanatçının adı, imzası ve yapıldığı yıl kurşun kalemle yazılmakta, baskılar renkli ise kaç renk olduğu belirtilmektedir. Osmanlılar döneminden kalma el yazması ve basılmış kitaplarda mülkiyet işareti olarak mühürleri kabul edebiliriz. Mühürler, exlibris türüne girmese de özgün kaligrafik özellikleriyle ait oldukları kişilerin arması olarak exlibris işlevini görmüşlerdir. Türkiye’nin exlibrisi tanıması, batıdan alınmış kitaplarla olmuştur.Avrupa ülkelerinde yaygın olarak kullanılan exlibrisi yapılan kitaplar, ikinci el satışlarla ülkemize girmiş, bu kitapların sahipleri öldüğü zaman ise yakınları tarafından kütüphanelere bağışlanmıştır. Milli Kütüphane,Boğaziçi Üniversitesi, Yapı Kredi Bankası Kütüphaneleri ve Basın Müzesi’nde eski kitapların çoğunda exlibrisler vardır. Exlibrisler, konulara, sanatçılara, tekniklere göre değerlendirilip meraklıları tarafından toplanmaktadır. Koleksiyoncular,ellerindeki çift baskıları,diğer kişilerle değiştirerek çok sayıda exlibrise sahip olmakta,bu degiş tokuş sayesinde kendi koleksiyonlarını kalite olarak geliştirmekte, Exlibris koleksiyonculuğu, uluslararası ilişkilerin gelişmesini, yeni dostlukların oluşmasını, farklı dönemlerdeki sanatın ve tekniklerin öğrenilmesini sağlamaktadır. 1980’li yıllardan bu yana özellikle, güzel sanatlar eğitimi veren kurumlardaki özgün baskıresim ve grafik tasarım derslerinde, exlibris çalışmaları yapılmaya başlanmıştır.Yurtdışında yapılan exlibris yarışmalarında ve sergilerinde ülkemizin adını duyuran sanatçılarımızın isimleri geçmektedir. 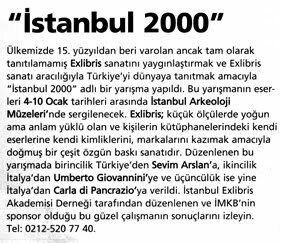 1996 yılında italya’da yapılan 3.Exlibris Bienali’nde Hasip Pektaş birincilik, 1997 yılında yine italya’da yapılan “müzik” konulu exlibris yarışmasında Sema Ilgaz Temel üçüncülük ödülü almışlardır. • Pektaş, Hasip, “Ülkemizde Pek Tanınmayan Bir Sanat Dalı: Exlibris”, Milliyet Sanat Dergisi, Temmuz 1989, Sayı:220, s.42-44. ../2 = Renk sayısı (S/2 = iki renkli serigrafi baskı) / Number of colours used /col. Not: 1958’de FISAE’nin Barselona Uluslararası Exlibris Kongresi'nde kabul edilmiş, Nisan 2000’de Belgrad ve Cenevre’de degişiklik yapılmıştır.